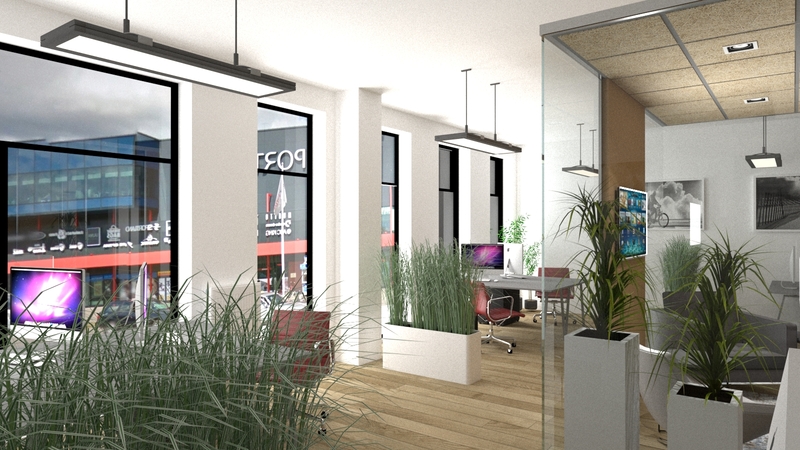 Web Expert turned to Palazzo Interior as it was necessary to design their new office in Pärnu. They wanted the room to be a beautiful, modern and comfortable place for the development team to work. Web Expert is a fast-developing software development company with 15 years of experience, aiming to create convenient and efficient IT solutions for both the public and private sectors. 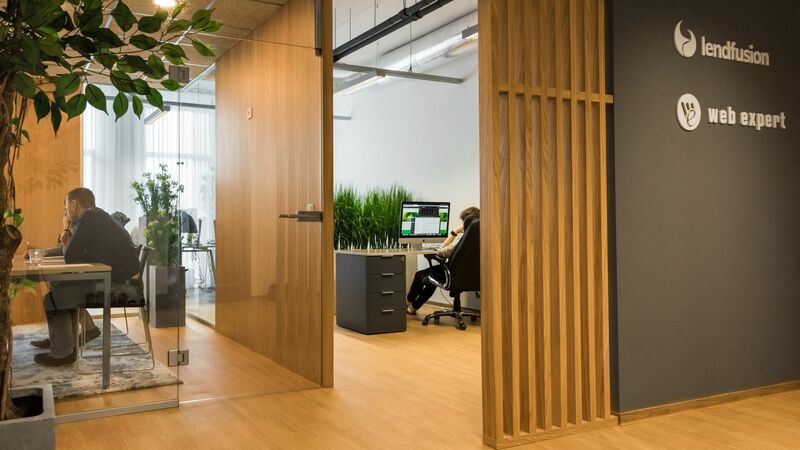 Their 20-member team started with the Tallinn office. Now they have also rented space on the third floor of the new business house in Pärnu, so that the team can add a few more people. The object was an empty space of about 100 square meters, only a toilet was built. 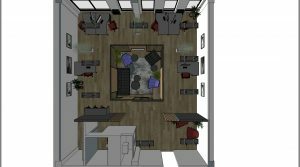 Our work plan was to make layout of the premises, choose a color solution , finishing materials and plan the entire furniture placement. 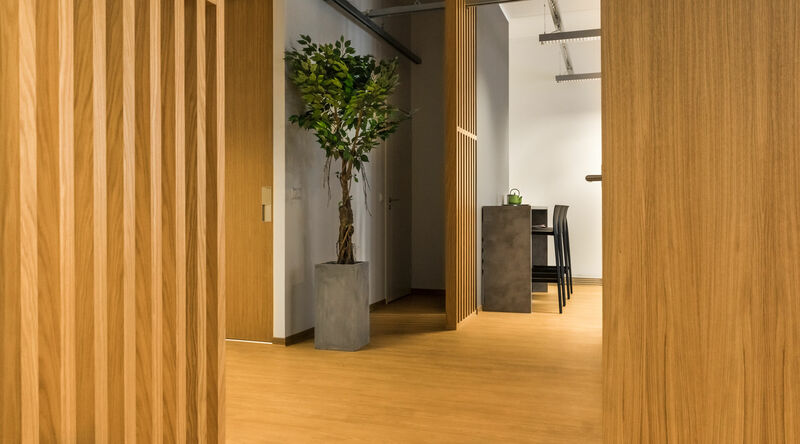 For the existing toilet, we designed wall extensions to accommodate an integrated wardrobe in the reception room and create space for the kitchen corner, coffee drinking and lunch on the other side. When entering the room from an outdoor corridor, the first place is the reception area. There is a small seating area and a wardrobe, which we drew to integrate with the toilets wall extentions. 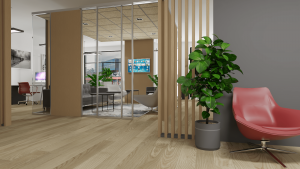 To separate workplaces and the reception area, we added a ribbon wall that allows people working right behind the wall do it privately, while leaving the room open. As the team is still small, the tables were positioned slightly apart to leave everyone some space and privacy. 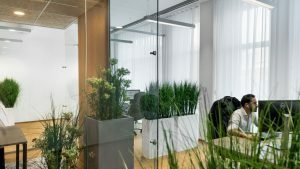 However, in order to maintain the opportunity for communication and not to separate people from each other, we have solved the division of workplaces with artificial plants. 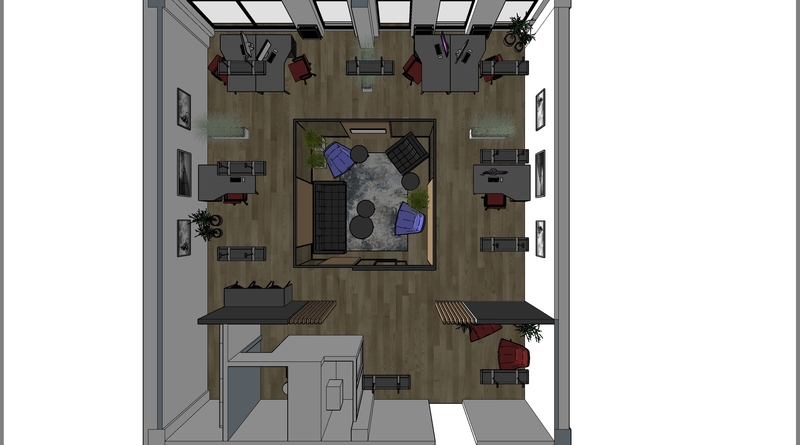 At the same time, with such layout we were still able to leave some room for extra tables if the team were to grow. To make the room more cozy and a bit more home-like, we added some illustrations to the walls and used soft and winding curtains for those large, floor-to-ceiling windows. 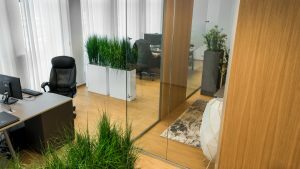 Despite the fact that the office where only the development team works and customers rarely visit, we planned a meeting room in the center of the office. This is necessary in order for people to get up from the desk and to look at things together. 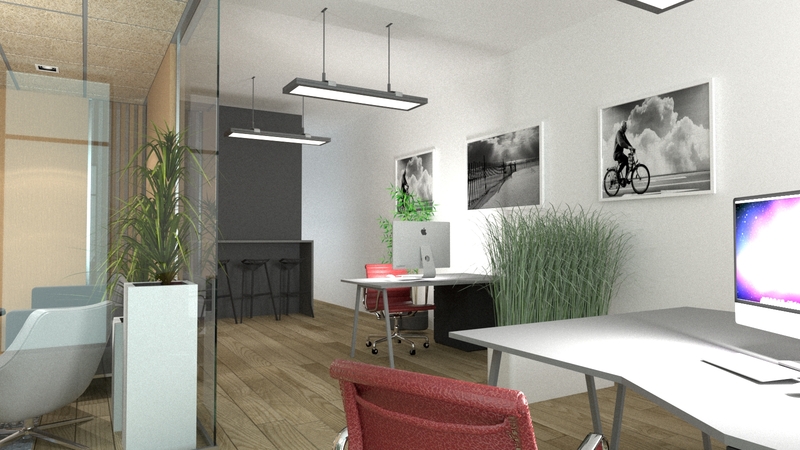 They can also use this space to work in a free format or just relax from sitting behind the desk. 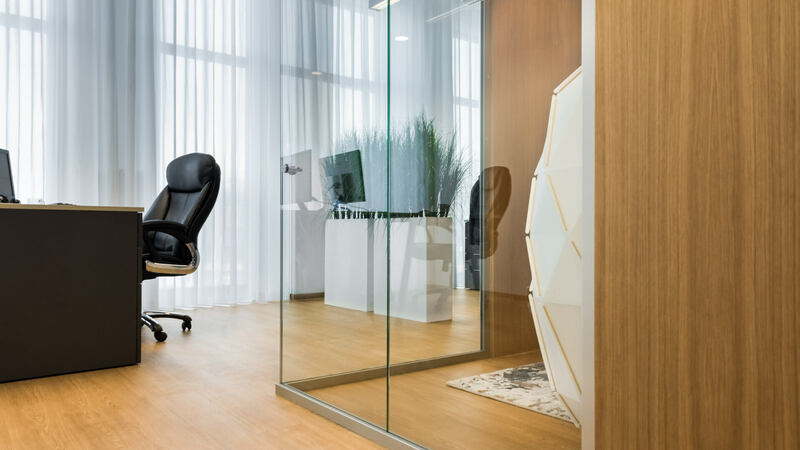 The meeting room partition walls are custom-made in cooperation with local manufacturers. The materials used for this are glass, some parts of the wall are veneered. We also lowered the ceiling and created a suspended from the fiber boards. From the interior and the furniture side we left the room simple but cozy by designing some sofas, plants and carpets, which the customer wanted to look for and acquire on their own. There is also a small coffee corner with table and chairs next to the external wall of the toilet. We didn’t do the kitchen right away, but we helped to draw it out. Office interior design is a very important part of the whole business. Proper planning can help improve employee satisfaction as well as overall productivity. 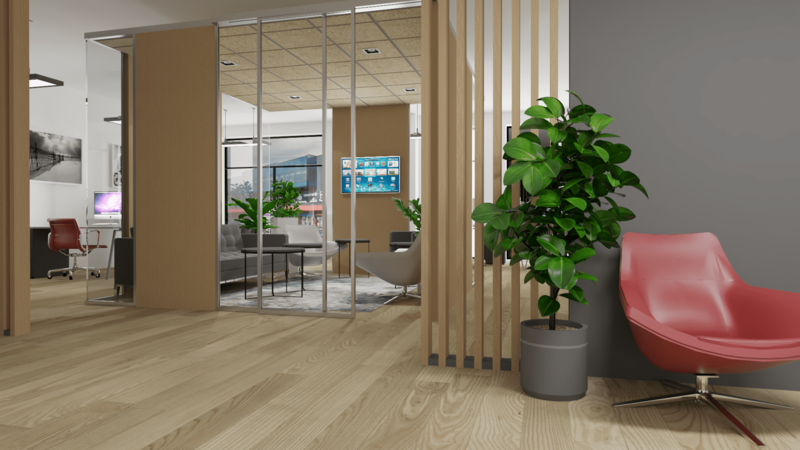 Designing the office for Web Expert, we sticked to a number of principles, which we have also discussed in our article “Office design should be cozy but productive!”.